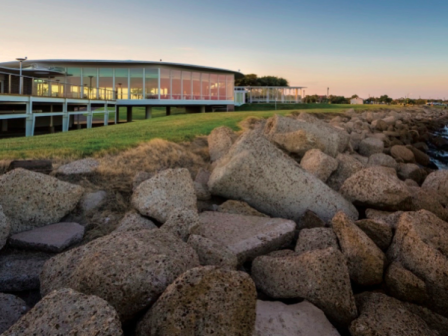 Sylvan Beach Park dates back to 1893 and since opening four different pavilions have served as entertainment venues for this beach-front property on Galveston Bay. Hurricanes destroyed the three prior pavilions and the current modernist style one, designed by Houston architects Greacen & Broginez, opened in 1956. The modern building is concrete-framed and its most significant architectural feature is the octagonal dance pavilion with its floor-to-ceiling perimeter window wall, a modernist interpretation of a traditional circular Texas dance hall. Over the years, the pavilion was widely used for a variety of events including dances and banquets, senior proms, anniversary celebrations, quinceañeras and family reunions. Numerous musicians have performed at the pavilion including The Coastliners, Tex Beneke, Manny Green, Micky Gilley and Ray McKinley and the Houston Symphony. Following damage sustained by Hurricane Carla in 1961, ground floor modifications were made and an addition was added. In 1978, a new upper drive and earthen berm, entry canopy and enclosed wooden walkway were added to provide handicap access directly to the ballroom, bypassing the original ground level staircase. Alterations to the dance pavilion were made following Hurricane Alicia in 1983 including the closure of all ground floor spaces. On September 13, 2008 Hurricane Ike, the seventh hurricane to hit Sylvan Beach Park, caused significant damage and Harris County closed the pavilion to public use. The fate of the building was uncertain. A local non-profit, Save the Pavilion, stepped in to secure three separate historic designations for the building: the National Register of Historic Places (NRHP), Recorded Texas Historic Landmark (RTHL), and State Antiquities Landmark (SAL). The owner, Harris County, secured federal funding from the Federal Emergency and Management Agency (FEMA) and the team began the process of upgrading the building to contemporary life/safety and wind storm codes while respecting the building’s historic designations. The use of federal funding and the SAL designation triggered a Section 106 review and required an Antiquities Permit from the Texas Historical Commission and allowed input from local preservationists and citizens. The site is located directly along the waterfront where storm surges of up to 14 feet can occur and strong winds off the bay are unobstructed. So, the design team had the challenge of renovating the building and site to better combat water infiltration, mitigate hurricane-force winds, and meet windstorm insurance requirements while respecting the historic design elements. New sump pumps were added to drain water from the ground level and the concrete structure received an acrylic coating to prevent chlorides in storm- and floodwaters from penetrating and weakening the concrete. The lower portions of the project use flood-resistant materials and avoid the use of sheetrock or carpet. The team worked with a manufacturer to custom-fabricate a window assembly that was tested for hurricane standard air and water infiltration and then reviewed by the Texas Historical Commission to ensure it met visual requirements. Harris County Precinct Two successfully rehabilitated this modernist gem on Galveston Bay that will be enjoyed for years to come.